your event 7 days a week. The new menu was added March 27, 2019. If you do not have the new menu, please click on the link above to download it now. The new menu has been organized and shortened for your convenience. Please take a moment and read our new payment and cancellation policy written on the FAQ page. The food. That's what Ann's Catering is all about. Platter upon platter, over 200 in all, of fresh dishes made to order for you. Look at the size of our menu! We are compelled by our love of food to offer as many choices as possible to our customers. Our customers say that it seems as if there's something new to try each time they see the menu. 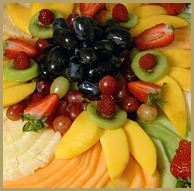 Ann's Catering has been preparing great food for 16 years now. Our catering team has created an extensive menu of scrumptious fork and finger foods. We've continued to grow over the last few years, but our aim remains simple: to win you as a customer, and have you return to us again and again.